The volume of published research is distributed between 1984- 2012 and across the regions North America, Europe, Oceania, Asia and Middle East. The simulation methods used were manikins, films, images or paper, live actors, animals and virtual reality. The staff categories focused upon were paramedics, emergency medical technicians (EMTs), medical doctors (MDs), nurse and fire fighters. The main topics of published research on simulation with prehospital care providers included: Intubation, Trauma care, Cardiac Pulmonary Resuscitation (CPR), Ventilation and Triage. Le recours à la simulation apparaît incontournable en pédagogie médicale. L'emploi de mannequins haute fidélité connait un essort majeur. Si la satisfaction des étudiants semble au rendez-vous, il n'est cependant pas si évident que la simulation haute fidélité soit dimensionnante en terme d'acquisition réelle de savoir faire. Les avis sont partagés. Ainsi C'est travail évoque un niveau de preuve relativement faible voir absent. Compte tenu du coût non négligeable des mannequins haute fidélité, un tel investissement doit donc être réfléchi. The objective of this study was to evaluate the effectiveness of high versus low fidelity manikins in the context of advanced life support training for improving knowledge, skill performance at course conclusion, skill performance between course conclusion and one year, skill performance at one year,skill performance in actual resuscitations, and patient outcomes. A systematic search of Pubmed, Embase and Cochrane databases was conducted through January31, 2014. We included two-group non-randomized and randomized studies in any language comparing high versus low fidelity manikins for advanced life support training. Reviewers worked in duplicate to extract data on learners, study design, and outcomes. 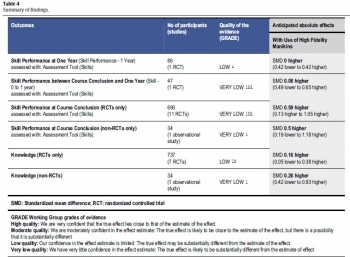 The GRADE (Grades of Recommendation, Assess-ment, Development and Evaluation) approach was used to evaluate the overall quality of evidence foreach outcome. The use of high fidelity manikins for advanced life support training is associated with moderate benefits for improving skills performance at course conclusion. Future research should definethe optimal means of tailoring fidelity to enhance short and long term educational goals and clinical outcomes. Simulateur ou vecteur biologique ? Hall AB. Am Surg. 2011 May;77(5):561-5. La simulation joue un rôle fondamental dans la foration aux gestes du sauvetage au combat. Le recours au vecteur biologique, au cadavre ou à des simulateurs artificiels reste sujet à débat. Le travail proposé montre que les simulatueurs artificiels sont aussi efficaces que les vecteurs biologiques. L'emploi de cadavres apparaît quand à lui poser le problème de leur disponibilité en nombre suffisant. There is a lack of objective analysis comparing live tissue and simulator training. This article aims to objectively determine the difference in outcomes. Twenty-four Air Force volunteers without prior experience performing emergency procedures were randomly assigned to receive training in tube thoracostomy (chest tube) and cricothyroidotomy training on either a pig model (Sus scrofa domestica) or on the TraumaMan simulator. One week posttraining, students were tested on human cadavers with objective and subjective results recorded. Average completion time for tube thoracostomy in the animal model group was 2 minutes 4 seconds and 1 minute 51 seconds in the simulator group with a mean difference of 12 seconds (P = 0.74). Average completion time for cricothyroidotomy in the animal model group was 2 minutes 35 seconds and 3 minutes 29 seconds in the simulator group with a mean difference of 53 seconds (P = 0.32). Overall confidence was 9 per cent higher in the animal trained group (P = 0.42). Success rate of cricothyroidotomy was 75 per cent in the animal model group and 58 per cent in the simulator-trained group (P = 0.67). Success rate of chest tube placement was 92 per cent in the animal group and 83 per cent in the simulator group (P = 1.00). There was no statistically significant difference in chest tube and cricothyroidotomy outcomes or confidence in the groups trained with live animal models or simulators at the 95 per cent confidence interval. Trends suggest a possible difference, but the number of cadavers required to reach greater than 95 per cent statistical confidence prohibited continuation of the study. Simuler 1 fois par an: Suffisant ? Certaines procédures de mise en condition de survie sont rarement réalisées en conditions réelles. Pourtant leur maîtrise par le personnel qui intervient doit être acquise. Se pose dès lors le problème de l'acquisition et du maintien de ces compétences techniques. la simulation est un moyen d'y parvenir. La coniotomie fait partie des ces gestes. Récemment il a été mis en avant que 5 réalisations simulées par des professionnels de l'urgence permettaient d'obtenir une relative maîtrise techniqe mais que cette dernière ne se maintenait pas au delà de 6 mois. (1). Le travail présenté confirme ces données. Background. Simulation has been shown to be effective in teaching complex emergency procedural skills. However, the retention of these skills for a period of up to 1 yr has not been studied. We aimed to investigate the 6 month and 1 yr retention of the complex procedural skill of cricothyroidotomy in attending anaesthetists using a high-fidelitysimulated cannot intubate, cannot ventilate (CICV) scenario. Methods. Thirty-eight attending anaesthetists participated individually in a high-fidelitysimulated CICV scenario (pretest) that required a cricothyroidotomy for definitive airway management. Immediately after a debriefing and structured teaching session on cricothyroidotomy insertion, subjects managed a second identical CICV scenario (posttest). Each anaesthetist was randomized to either a ‘6 month retention’ or a ‘12 month retention’ group. No further teaching occurred. At their respective retention times, each anaesthetist managed a third identical CICV scenario (retention post-test). Two blinded experts independently rated videos of all performances in a random order, using a specific checklist (CL) score, a global-rating scale (GRS) score, and procedural time (PT). Results. 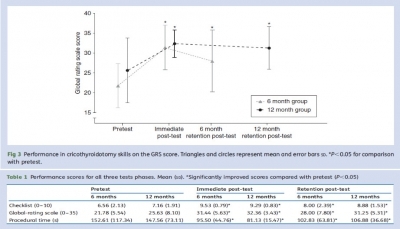 Subjects from both groups improved on their cricothyroidotomy skill performances from pretest to immediate post-test and from pretest to retention post-test, irrespective of the retention interval; CL mean (SD) 8.00 (2.39) vs 8.88 (1.53), P¼0.49; GRS 28.00 (7.80) vs 31.25 (5.31), P¼0.25; PT 102.83 (63.81) s vs 106.88 (36.68) s, P¼0.73. 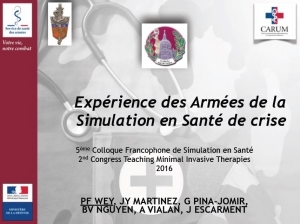 A partir de la rentrée universitaire 2013 et dans le cadre du projet SAMSEI , l'université de médecine proposera une formation à la simulation. Fidèle au principe d'enseignement par ilmmersion ce DU est conduit avec l'ensemble des structures universitaires lyonnaises mais aussi le service de santé des armées notamment le CITERA de l'HIA Desgenettes, Le Cefos et l'Institut de recherche du SSA. Les modalités pratiques d'inscription à ce DU sont disponibles sur ce lien.